Liquid crystal temperature indicators can be made in various formats and with temperatures ranging from -20°C to 90°C. Reusable, unbreakable, mercury-free, non-toxic and no batteries. 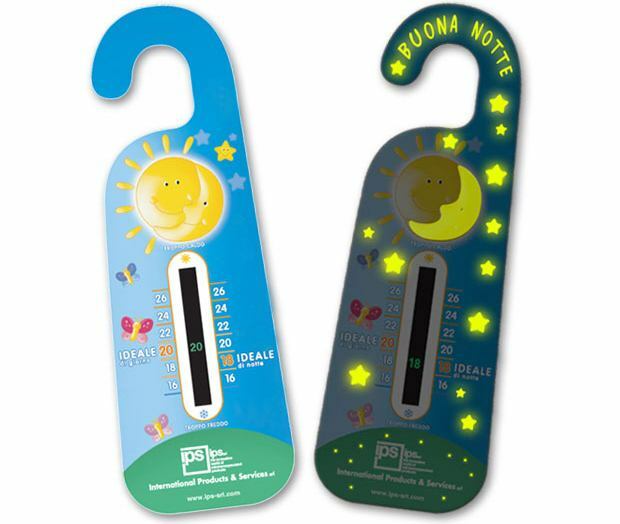 They permit to enhance endless of solutions to check room temperature such as wall and tabletop calendars, store displays and posters, rulers, bookmarks, nice thermometers for the babies’ bedrooms and pocket cards. Thermometer – a help for saving energy! Thermometer tells you in just a few seconds if energy is being needlessly consumed, so you can check whether the heating system is set correctly and your home is properly insulated. Each room has an ideal temperature: therefore it is not necessary to maintain the same heating conditions in every interior. Just reducing the temperature by 1°C can cut energy consumption by 6% ! A room thermometer that is always within reach and lets you constantly monitor the room temperature so you can live in comfort at all times of the day. 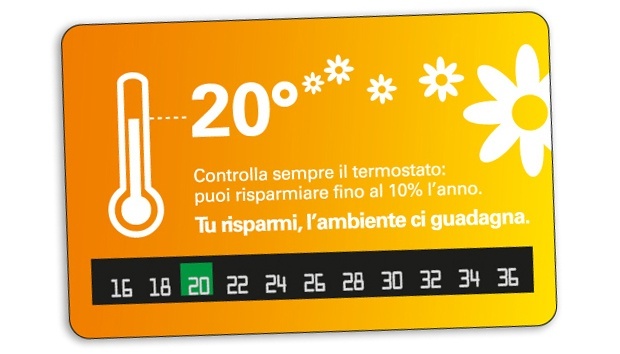 20°C is sufficient for our normal living environments, whereas, for example, the right temperature for a bathroom is 21°C. In the kitchen 18°C is enough because the oven and cooktop produce extra heat; in bedrooms 17-18°C is ideal for good breathing. Therefore, if every interior has an ideal temperature, why waste energy needlessly? With Thermocard you can check whether the heating system has been correctly set or whether your home is sufficiently insulated to avoid a pointless waste of money. 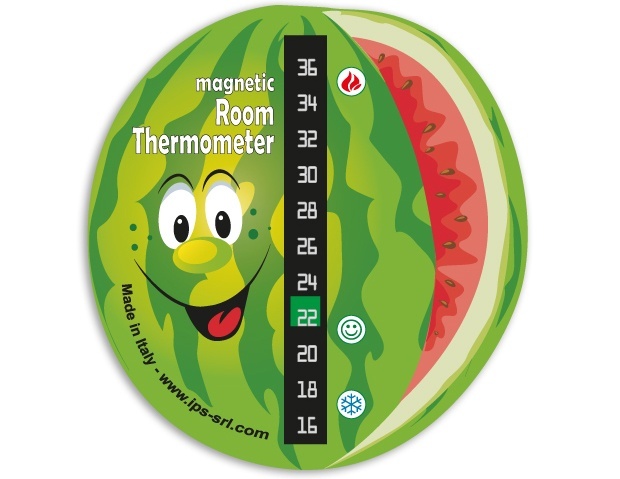 A Magnetic room thermometer that is always within reach and lets you constantly monitor the room temperature so you can live in comfort at all times of the day… furthermore it is magnetic therefore you can easily put it on the refrigerator door or other metal support at your choice. Nice to be placed in the kitchen but it can also be positioned in other rooms because it can be realized in any shape to perfectly fit with specific requirements. Experts say that during infancy it would be better if the room temperature were kept at around 20°C during the day and 18°C during the night. 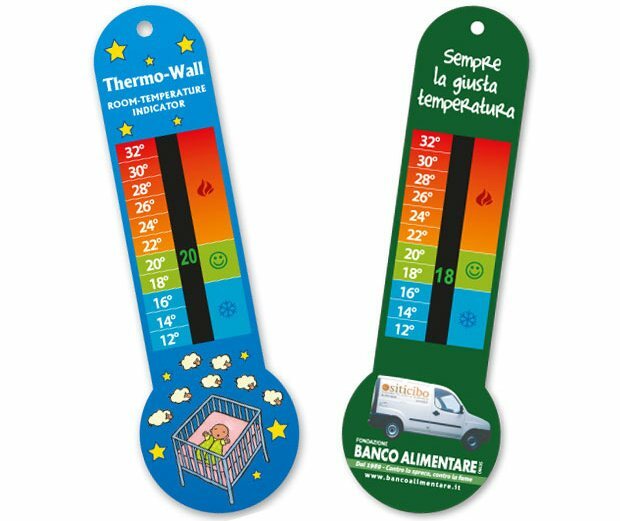 Thermo wall is a valid aid to all mothers…it can be hung on the wall inside the baby’s bedroom and thanks to its room thermometer, it enables constant monitoring of the room temperature. But that’s not all, because the nice images and/or words make it a cheerful decoration for the baby’s room. It allows mums to constantly monitor the temperature of the baby’s room, in order to prevent temperature changes, which can harm the baby’s health. Fully customizable (in size, design and shape), Baby Thermo-room can be perfectly adapted to specific needs. It can also have a hygrometer incorporated in it to check the level of humidity of the air because an excessively damp environment can be unhealthy and cause mould to form, whereas excessive dryness can provoke allergies and breathing problems. Reading …a hobby, but also an occasion for relaxing. So a good book or favourite magazine is a “must”, but you also need the right atmosphere and a perfectly comfortable room temperature. 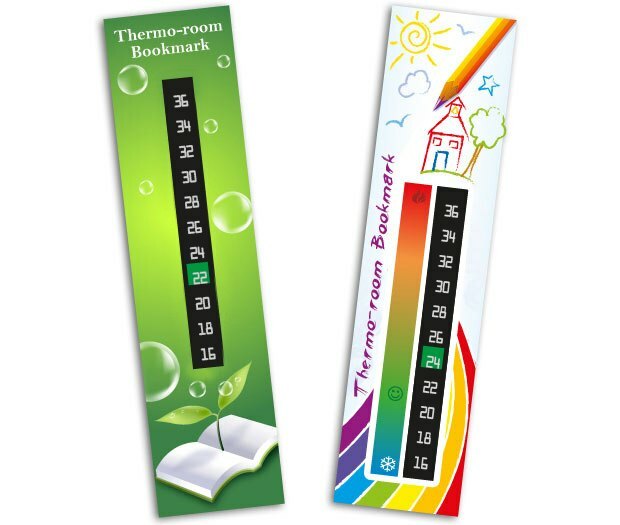 Thermo-room bookmark not only indicates what page you are on, but also the room temperature thanks to a liquid crystal thermometer. So … not too warm …not too cold …but JUST RIGHT ! The “out of the ordinary” calendar to stand out by giving something useful. The liquid crystals thermometer applied to the calendar allows to constantly check that the temperature of the rooms where we live is always in the best conditions of comfort. The optimum combination of Temperature and Humidity ensures our physiological well-being. 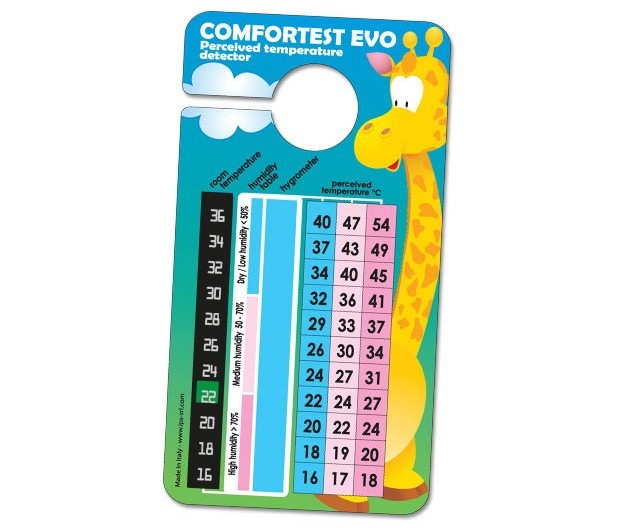 Comfortest Evo indicates the temperature perceived by our body verifying the correlation between the actual temperature and relative humidity in the air, both measured at the same time. The ideal temperature is between 18-24° C and relative humidity between 40-60%. 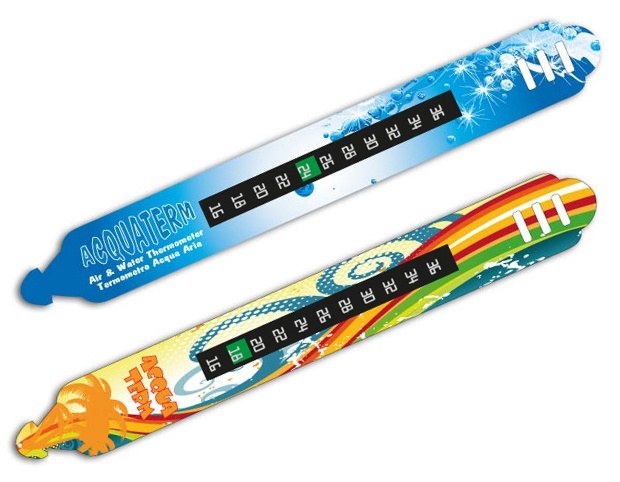 A soft thermometer to be sewn onto the next autumn – winter apparel so that the wearer can check the outdoor temperature and always know when to get protection from the cold and when to plan on skiing, since if the temperature rises dry snow will turn into wet snow, whereas if it falls the wet snow will become hard. Thermosport can be also sewn to swimsuits and used to check not only the temperature of the air but also of the water for pleasant bathing at the right temperature. A useful gadget for daily use. 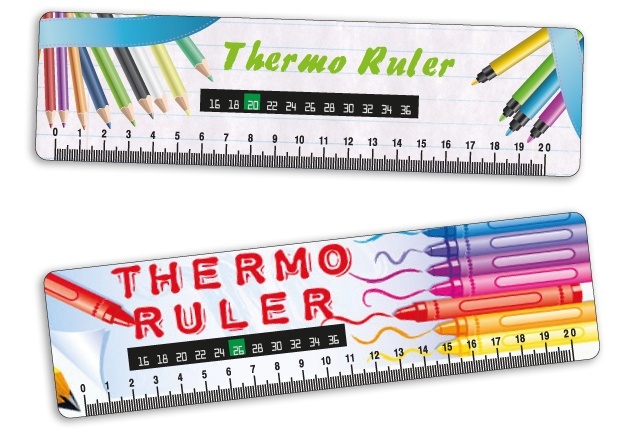 It is not only a ruler but also a real thermometer that allows a continuous monitoring of the room temperature to live in comfort at all times of the day: in the office, at home, at school or on vacation. It is unbreakable and ultra slim that can also be sent with a mailing letter. Thanks to the liquid crystals thermometer, Acquaterm indicates the air and water temperature for pleasant bathing at the right temperature. Useful for mums and funny for kids. A solution that will make unique the packaging of your product. By adding the room thermometer you can verify the temperature of the environment to live in the best conditions of comfort. Furthermore in case of pharmaceutical products it is useful to control the proper storage temperature. 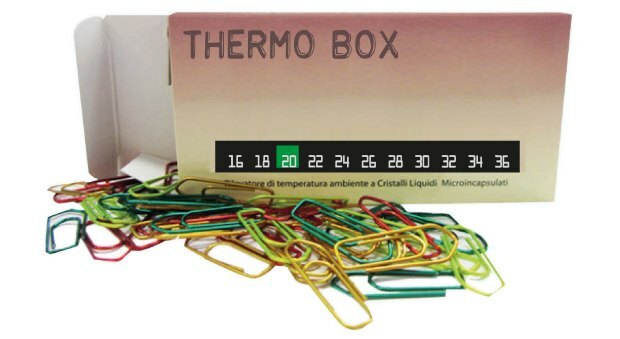 By combining the useful clips it becomes a nice promotional product to give away to get your brand / product remembered. Bathermo indicates whether the water is too cold – just right – too hot. 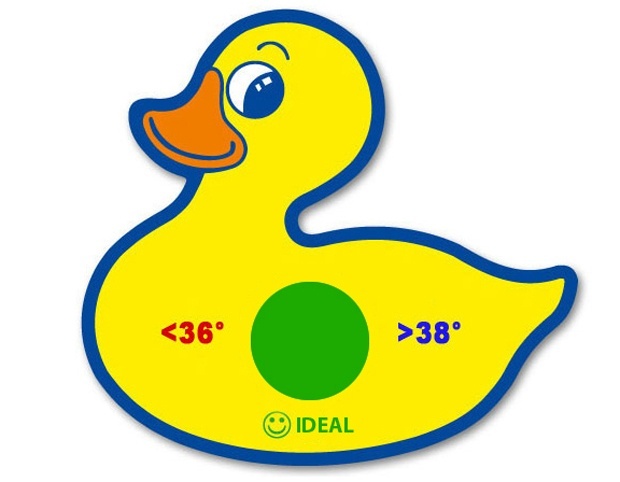 Reusable an infinite number of times, waterproof, non-toxic, producible in any shape and colour. Made according to European quality standards and comply to applicable clauses of EN71. Useful to check the baby bath water. Bath is strongly recommended for babies and kids but the first thing to get right is the temperature of the water: not too hot, not too cold, but always at the same pleasant temperature. Bathermo lets you keep a constant check on the temperature to avoid scalding or chills. Mums can check the water temperature in just a few seconds, and the babies can splash about with their new funny and coloured bath toy. Non-toxic and reusable, always ready to use. Bibotest can be applied to a baby bottle thanks to a static non-adhesive support in order to check the temperature of the contents (cold- just right- hot). It can be removed and reapplied several times, so that the bottle can be washed and sterilized. It can be applied to the baby bottle thanks to a static non-adhesive support in order to check the temperature of the contents (cold- just right- hot). It can be removed and reapplied several times, so that the bottle can be washed and sterilized. Liquid Crystals Thermometers for wine/beer/soft drinks/vodka let you know whether the temperature is right for an optimal tasting. Unbreakable and reusable, they are applied directly on the bottle or on the can, beneath the contents. Completely custom-made according to specific needs. 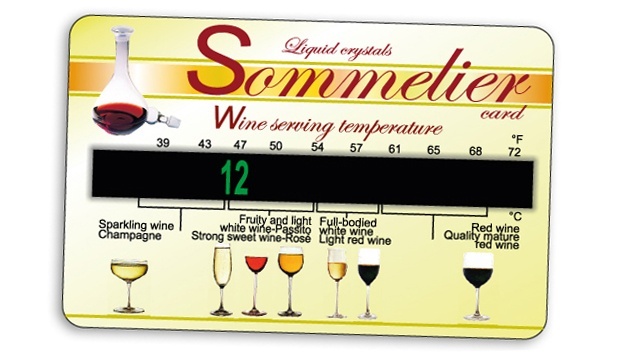 Sommelier card let you know whether the wine temperature is right for an optimal tasting. Unbreakable and reusable, it is applied directly on the bottle beneath the contents. Completely custom-made according to specific needs. 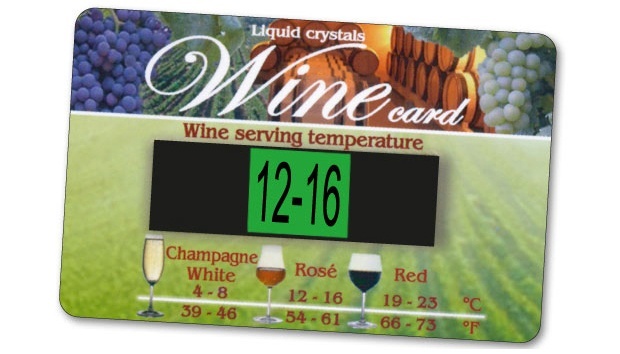 Wine card let you know whether the wine temperature is right for an optimal tasting. Unbreakable and reusable, it is applied directly on the bottle beneath the contents. 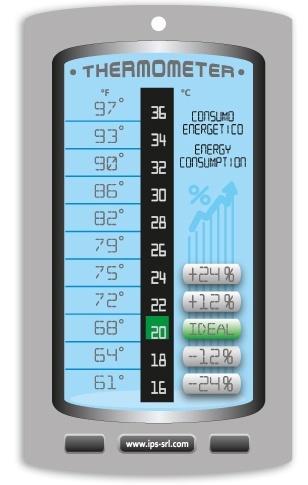 Digital Wine Thermocheck let you know whether the wine temperature is right for an optimal tasting. Unbreakable and reusable, it is applied directly on the bottle beneath the contents. Thermometer which permits to taste beer at the right temperature. 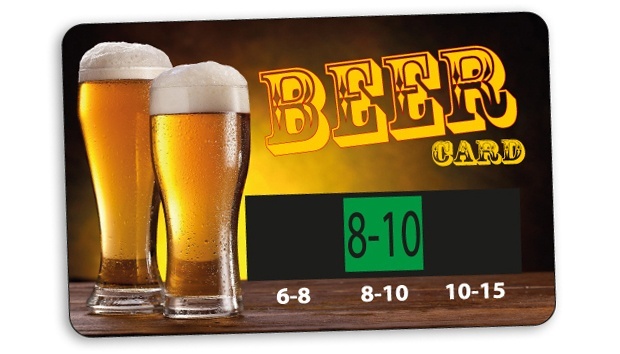 Just apply the card to the bottle, can or glass, beneath the contents, to check in a few seconds if the temperature is ideal for the type of beer chosen. 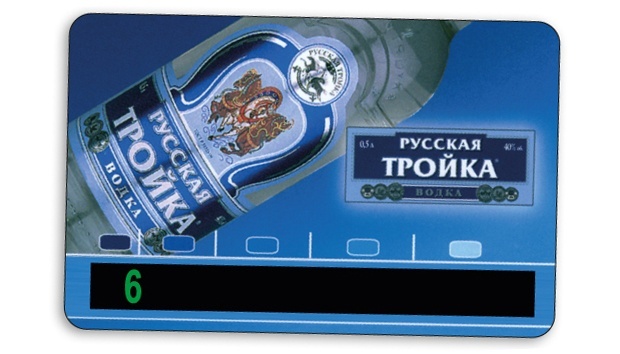 Vodka should be tasted at the right temperature (+4/+6°C), not too warm and not too cold … It permits to check the right tasting temperature in just a few seconds by applying it to the bottle or glass beneath the contents. 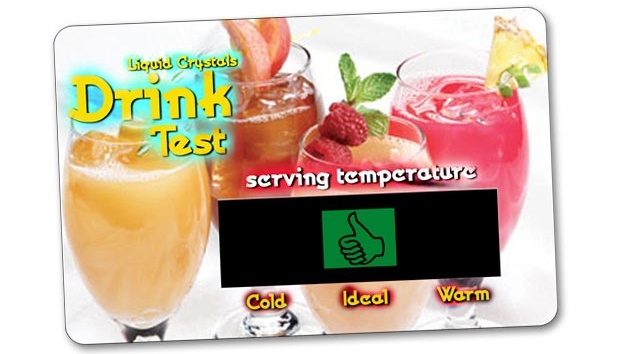 Drink test permits to check the temperature of your drink by applying it to the bottle, can or glass beneath the contents. Thermometer for white, red and pink wines. 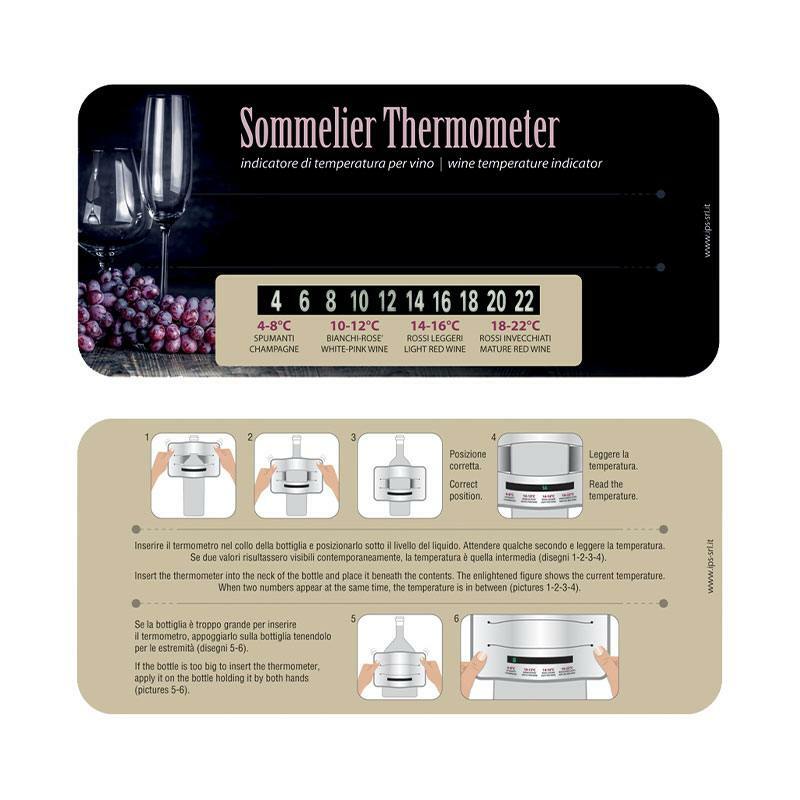 Sommelier thermometer is a promotional product that lets you control, easily, if wine is at the right temperature to be tasted. This thermometer can be inserted into the neck of the bottle to allow a continuous monitoring of the temperature of white, red and pink wines. Unbreakable and reusable, it can be fully customized according to specific needs. Thermofrige indicates the precise temperature inside the fridge for storing foods correctly and lengthen their storage life. It can be completely personalised to communicate a promotional message or remind users of their favourite brand. It provides useful information for storing products correctly, it helps keeping logo and promotional message always visible at a glance when consumers are deciding what to buy, reminding them what their favourite brand is. 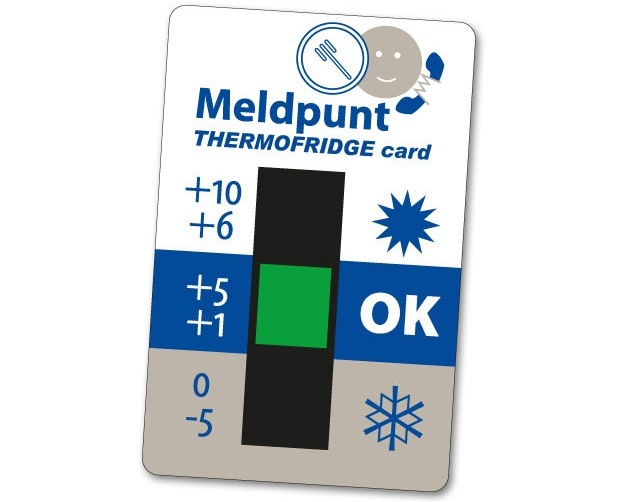 Besides, the temperature inside a refrigerator is not always the same: it is usually colder at the top and warmer at the bottom, so it’s important to provide tips as to which foods should be placed on the various shelves and the temperature should be constantly monitored to ensure optimal preservation. The thermometer also helps to check if the refrigerator is working properly and the maximum temperature inside does not exceed 7.5 ° C (over this temperature there is a risk of formation of bacteria harmful to health). 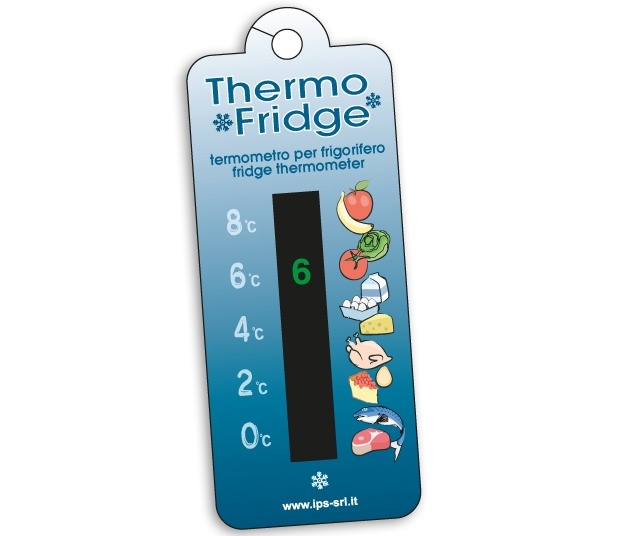 The thermometer also helps to check if the refrigerator is working properly and the maximum temperature inside does not exceed 7.5°C (over this temperature there is a risk of formation of bacteria harmful to health). 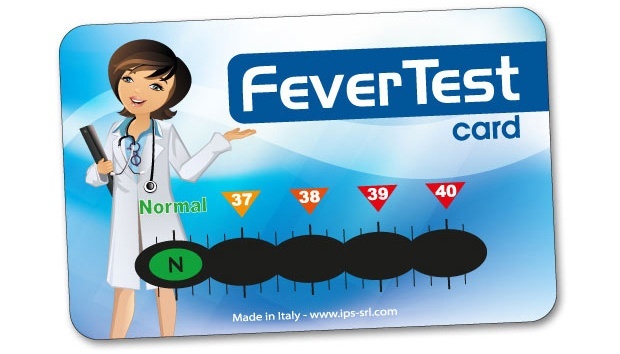 Fevertest indicators provide a clear reading of body temperature indicator in just 15 seconds. The card version also offers ample space for custom features. The quality guarantee is regulated by Council Directive 93/42/EEC . 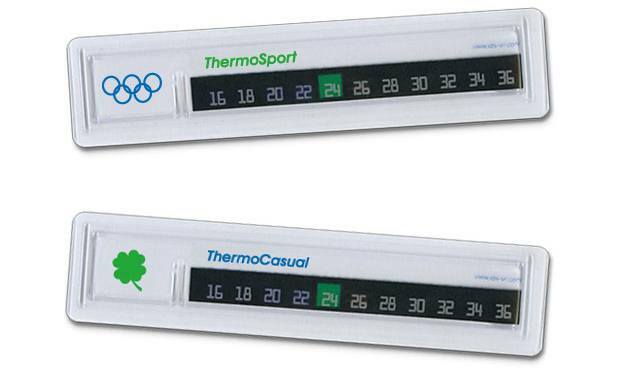 The temperature indicators are medical devices with measuring function and bear CE marking. to take a temperature in just a few seconds. It permits to check the body temperature in just 15 seconds and thanks to the practical pocket size you can bring it everywhere (at home, school, office and while travelling). It can be reused a countless number of times and it is unbreakable. 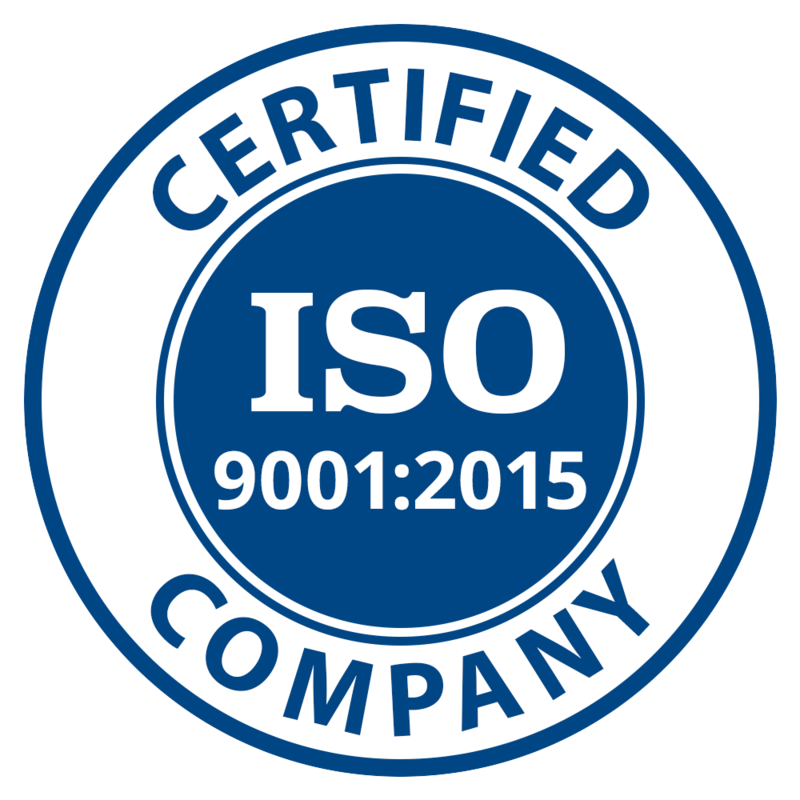 As a guarantee of reliability, Digital Fevertest card is a medical device and bears the CE mark to certify its compliance with the quality standards imposed by Council Directive 93/42/EC. 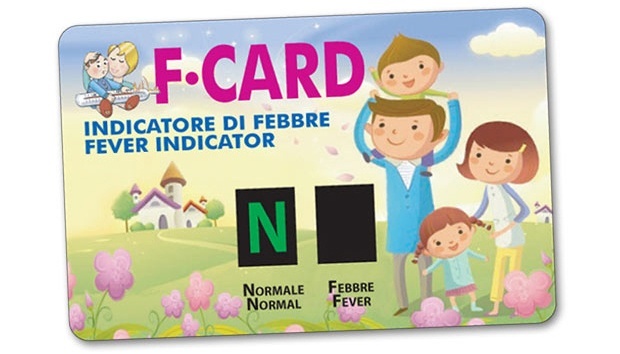 Easy to use, it provides an extremely fast method for telling whether a person has a fever: just rest the card against the forehead and after a few seconds the body temperature will appear on the encapsulated liquid crystal indicator. As a guarantee of reliability, the Digital FeverTest strip is a CE marked medical device with the quality standards imposed by Council Directive 93/42/EEC. 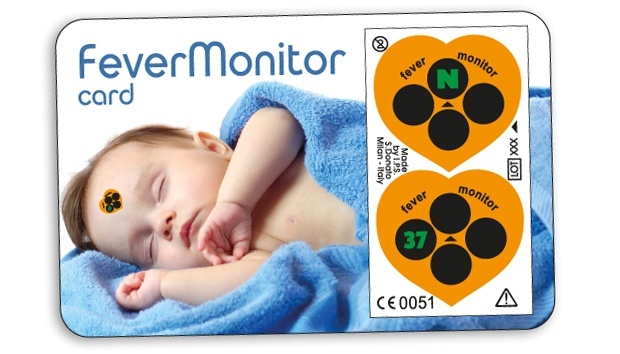 Fever thermometer to be placed on the forehead to check body temperature in just a few seconds. If the letter “N” appears, your temperature is normal while if the letter “F” is visible, you might have a fever. F-card is a CE marked medical device in accordance with Council Directive 93/42/EEC. Once positioned on the forehead the indicator constantly reads the body temperature, allowing the fever situation to be monitored without having to continuously disturb the child. The guarantee of quality is regulated by European Directive 93/42/EEC, which makes CE marking mandatory. 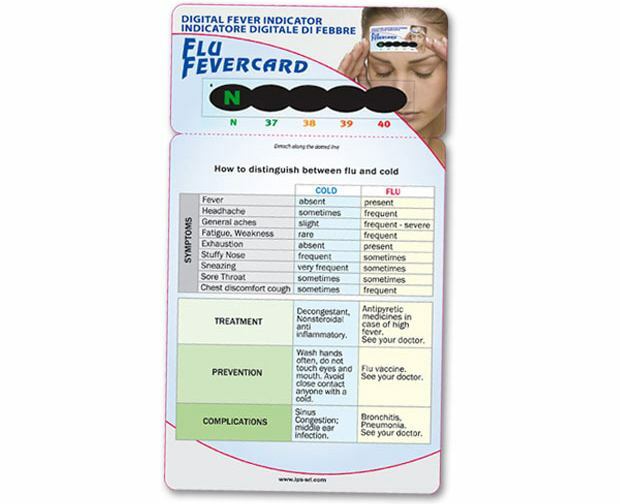 Forehead fever thermometer with detachable symptoms chart with precious information on how to distinguish flu from a simple cold for a fast screening before seeing the doctor Flu Fevercard is a CE marked medical device conforming to Council Directive 93/42/EEC. 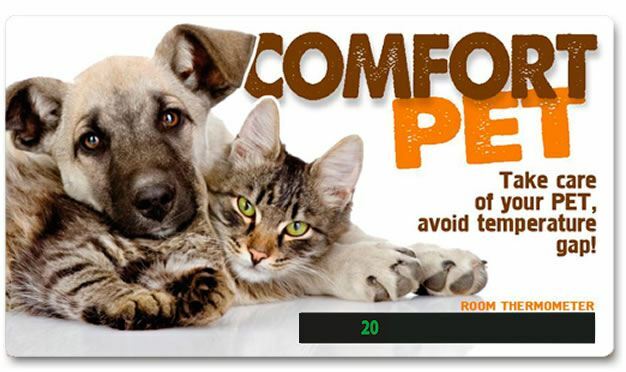 COMFORT PET – take care of our pets! The thermometer always within reach that allows a constant control of the room temperature in order to avoid temperature gap, which are harmful to the health of our loved pets. In summer, the temperature inside a car increases rapidly and even if the windows are left open the car will soon turn into an oven! An animal left closed in a car under such conditions can die quickly, even in just 10 minutes! Pet Auto Alert is a liquid crystal thermometer that reads the temperature inside a car in just a few seconds, thus becoming an indispensable tool for alerting to the “danger”. 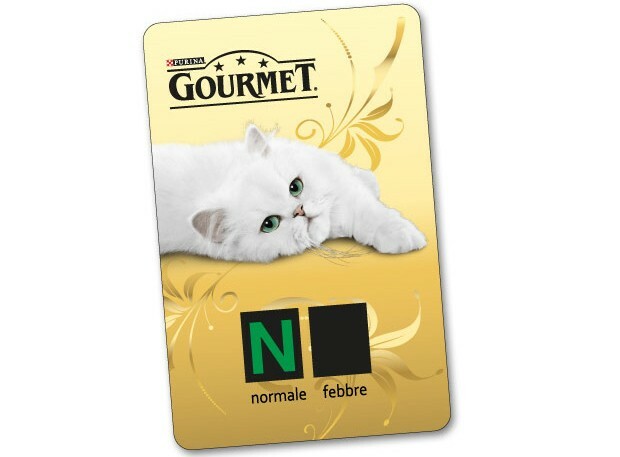 Useful for a first and quick test, just press the liquid crystal side of the card against a hairless part of your body’s pet, for example the belly or ear, and hold it there for 10-15 seconds in order to know if your pet is fit or if he has a fever. 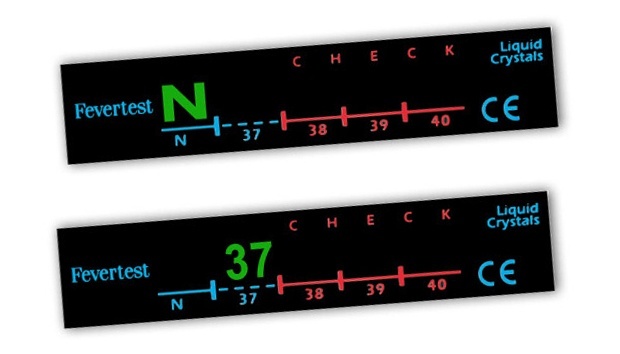 It is sufficient to apply the indicator on the side view mirror of the car to find out when the outside temperature falls and the road may become slippery due to ice. 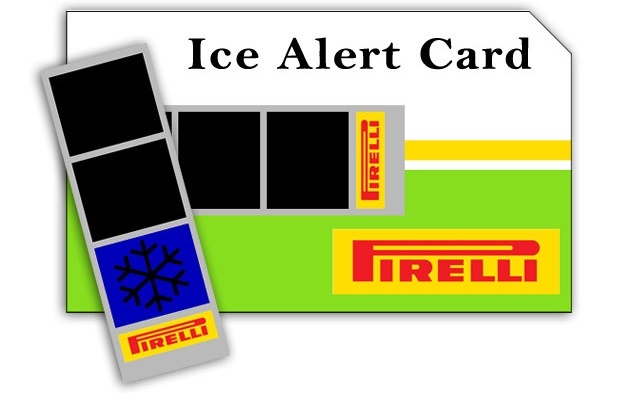 The card offers ample space for custom features; one corner can be configured for measuring the tyre tread depth and a side of the card can be used to scrape ice off of car windows. Winter tyres card should be fitted when the outside temperature is less than or equal to 7°C for a few consecutive days. 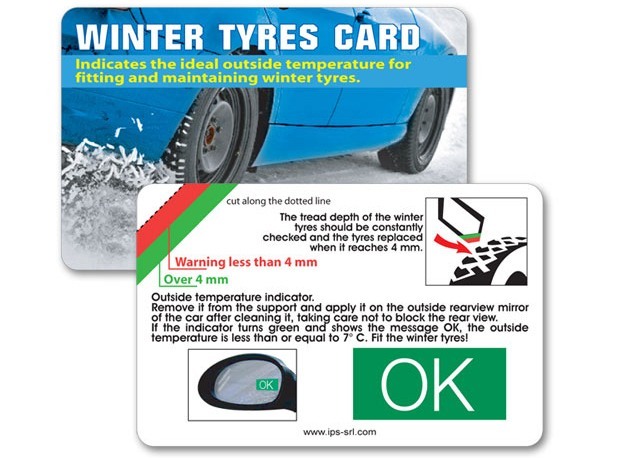 Winter tyres card indicates the ideal temperature for fitting and maintaining winter tyres. It also indicates the tread depth of the winter tyres which have to be replaced when they reach 4 mm. 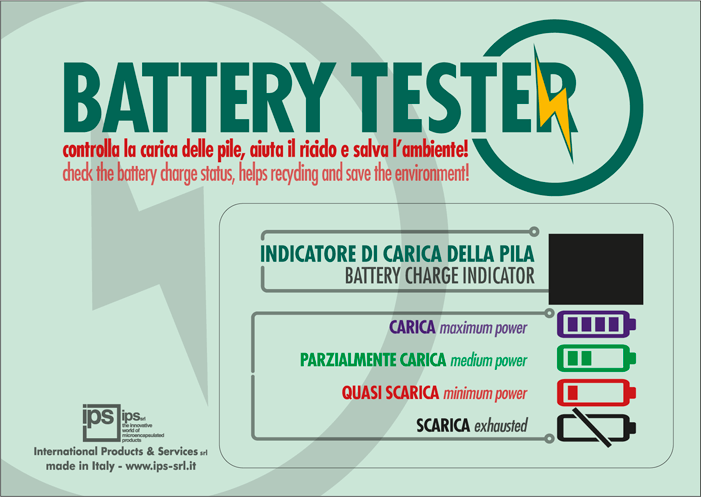 Useful to keep level charge of your batteries under control and, before bringing them to a collection center, check if they are completely exhausted.